Have you ever looked at your empty cup of coffee and just wished you could devour it? You’d probably survive eating your standard paper cup, but it wouldn’t be the most tasty of experiences. 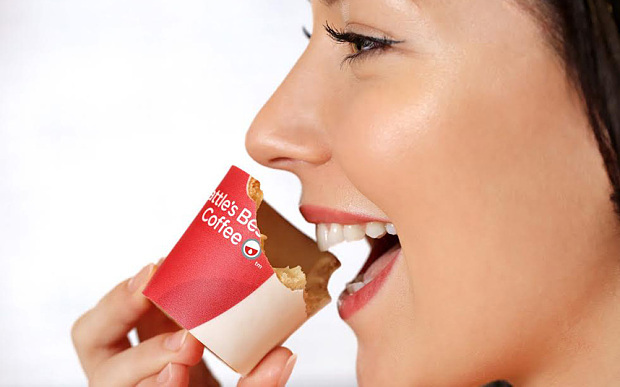 Thank god there’s KFC, which is introducing an edible coffee cup in the UK. The “Scoffee” Cup is intended to promote the chicken chain’s launch of Seattle’s Best Coffee at KFC eateries in the UK. It was developed by food scientists at a company called The Robin Collective, creators of things like edible terrariums and a margarita that changes colors. The cups consist of a cookie (or “biscuit,” as they inexplicably say in England) wrapped in sugar paper that is lined with heat-resistant white chocolate. The Scoffee Cup is still in development, but KFC plans to bring them to a limited number of stores later this year. Does Caffeine Make You Crave Sugar?